2.Reasonable price, safty sale and delivery management. 3.Provide 30-day money back or free exchange guarantee. 4.Get the answer within 12 hours when you have any question. 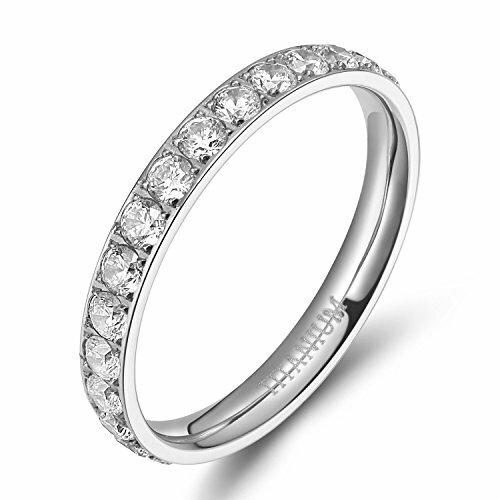 These eternity rings are set with beautiful high quality cubic zirconia stones. Cubic Zirconia is a stone so optically close to diamond. The man-made stone is virtually flawless whereas most diamonds have internal inclusions or external blemishes. It is a high quality synthetic gemstone which imitates the appearance of diamonds. This means your stones will be sparkling and full of fire. Cubic zirconia is zirconium oxide (ZrO2), a mineral that is extremely rare in nature. Synthesized CZ is much less expensive than diamond, optically flawless and can be created in a variety of different colors. Why you choose Titanium Ring? 1.Titanium rings won't scratch as easily or corrode. 2.Titanium ring won't dent or bend. 3.Titanium stands up better to daily wear and tear. 4.Titanium rings are attractive and comfortable for men as well as women. Your titanium ring requires no complicated cleaning or maintenance procedures. To make a cleaning solution for titanium jewelry, simply mix warm water with a few drops of mild soap. It is best to avoid using an ultrasonic jewelry cleaner when cleaning titanium rings. Keep your titanium ring away from harsh chemicals. Avoid your ring impacting on any hard substances. When taking off your ring, you can place it inside the ring box and then put the box in a safe space.